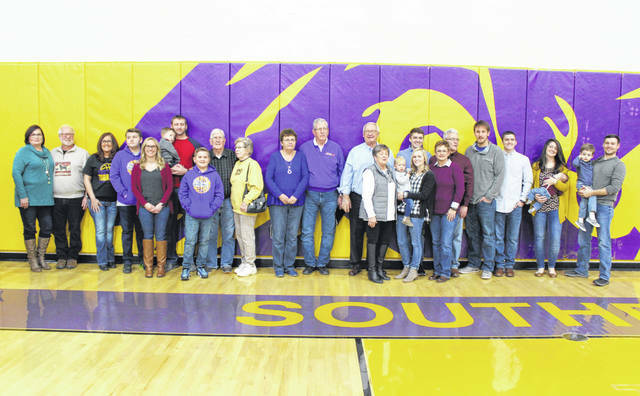 Southern Local Hall of Fame Class of 2019 inductees Gordon Fisher and Ronnie Salser are pictured with their families during at Friday’s induction ceremony. Gordon Fisher (center), pictured with his family, was one of two inducted into the Southern Local School District Hall of Fame on Friday evening. 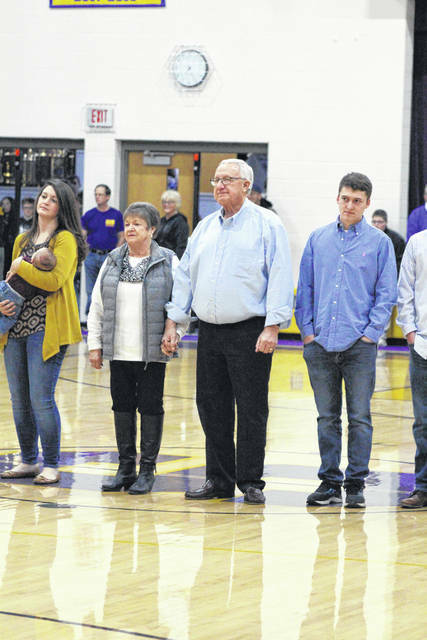 Ronnie Salser (center), pictured with his family, was one of two inducted into the Southern Local School District Hall of Fame on Friday evening. 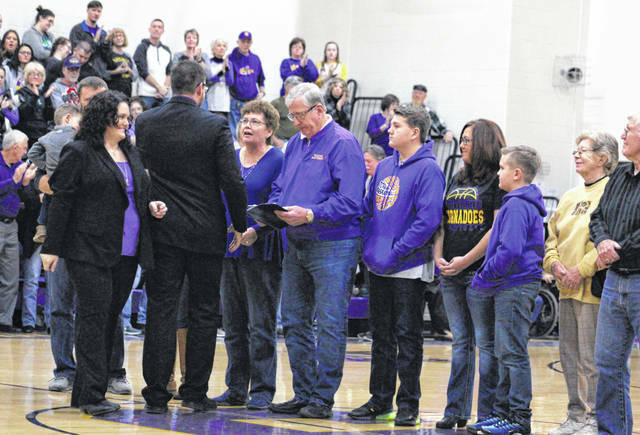 RACINE — Gordon Fisher and Ronnie Salser were inducted into the Southern Local School District Hall of Fame on Friday night as part of the Class of 2019. In January 2013, the Southern Local Board of Education established the Southern Local School District Hall of Fame to recognize Southern Local School District graduates, employees, and major contributors who have distinguished themselves by their individual contributions in scholarship, athletics, career, community service, and or society as a whole. Fisher was born and raised in Minersville, Ohio in 1947, and is a 1965 graduate of Southern. While at Southern, he lettered in football, basketball, baseball, and track. He attended Mountain State College on a basketball scholarship from 1965-1967 earning a degree in Higher Accounting. After working for Ben Tom and saving enough money, he enrolled at Malone College and graduated in 1970 with a Bachelor of Arts Degree in Business and Economics. He taught for nine years in the Indian Valley School District. While at Indian Valley, he coached track for six years and basketball for eight years. Six of those years were with Hall of Fame Coach Charlie Huggins. In August 1979, the family moved back to Meigs County and he accepted a teaching position at Meigs High School. He would spend the next 14 years at Meigs, eight as a teacher and six as an Assistant Principal. While at Meigs, he coached track for 14 years, basketball for three years, was athletic director for 12 years, and served as OHSAA Sectional Tournament Director in boys basketball for seven years, girls basketball five years, and baseball for three years. In the fall of 1993, he was back at home as the Principal of Southern High School. At Southern he took great pride in his school, staff, students, and community. He raised money through dinners to paint the entire high school, put TV’s in every classroom, air conditioners in every classroom, and refinish the gym floor. He spent every summer helping the custodians and coaches complete the job. He would serve as the prom advisor and class advisor for 11 years, and athletic director for one year. He was a volunteer varsity basketball assistant to Coach Jay Rees, Coach Jonathon Rees, and Coach Steve Randolph. Currently, he is the President of the Carleton College Board of Trustees. He is the creator and Chairman of the Racine-Southern Scholarship Association. Since 2000, there have been 225 Southern Seniors receive scholarships from this association. He is the Vice President, Activities Director, and Cook at the Syracuse Community Center. The Center averages 336 days of activities each year. This winter he coached elementary basketball having both a 3rd and 6th grade team. He and his wife Linda (48 years) have two sons, Mason a Trauma Surgeon at Gundersen Lutheran Hospital in La Crosse, Wisconsin, and Jeremy who is the Assistant Prosecutor for Gallia County and Magistrate here in Meigs County. He and Linda love spending time with their grandsons; Xander, Connor, Alex, Nicholas, and Kai. Accompanying Fisher for the honor were his wife, Linda; son, Jeremy, his wife, Stephanie and their son, Kai; his sister, Barbara Fisher; his brother, Bill and his wife, Dorothy Fisher; grandchildren, Xander and Conner and their mother, Jodi Fisher. Salser was born on the family farm in Dorcas, Ohio, in 1941 to the late Grover and Emma Salser. He is a 1959 graduate of Southern Local. While at Southern, he was a member of the varsity basketball team for four years and baseball team for one year. He would tie Larry Price for competing in the most varsity basketball games in a career (91 games). His teams would make it to the District finals both his sophomore and junior years. During his basketball career he would score 1,089 points, 476 his senior year leading his team, known as the “Fab-Five”, to the Meigs County Championship, District Championship, and Regional Runner Up, losing to Lynwood Jacksontown, the State Champions that year. He earned 3rd team All State Honors his senior year. After high school, he attended Ohio University and graduated from Hobart School of Welding. He is a 49 year member of the Boilermakers Union Local 667. He has always had a great love for Southern Local Schools and Southern Athletics and has given back to the district and community for many years. He was a volunteer basketball coach for several years and coached all four of his grandchildren. He served the school district during a very crucial time as a member of the Financial Advisory Board. You will find him at all the school the school blood drives, where he has given more than six gallons of blood over the years. Being a man of high moral character, he has been a member of the Racine First Baptist Church for over 50 years. In 1970, he started teaching a youth group and continues to teach adult Sunday school classes today. He and his wife of 55 years, Cookie have a daughter Tonja. Salser was accompanied for the honor by his wife, Cookie; daughter, Tonja and her husband Doug Hunter; grandchildren, Jacob and Ashton Hunter, Emma and Weston Roberts, Lucas Hunter and Eli Hunter; and great-grandchildren, Easton and Adler Hunter and Elliott Roberts. In the stands were his twin sister, Rose Evans and her husband, Clyde; sister, Carmen Price and her husband, Sam; and several nieces and nephews. Information provided by Southern Local School District.